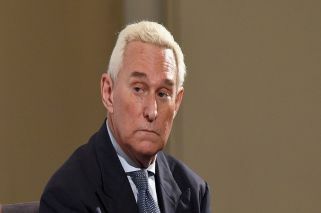 Shouting "FBI, open the door," authorities arrested Roger Stone, a confidant of United States President Donald Trump, before dawn Friday in a criminal case that revealed that senior members of the Trump campaign sought to benefit from the release of hacked emails damaging to Hillary Clinton. The seven-count indictment against Stone, a self-proclaimed "dirty trickster" with a long history with Trump, is the first criminal case in months from U.S. special counsel Robert Mueller. Stone appeared at court in shackles later in the morning and was released on a $250,000 bond. He did not enter a plea. The indictment does not charge Stone with conspiring with WikiLeaks or with the Russian officers Mueller says hacked the emails. Instead it mirrors other Mueller cases in alleging cover-ups and deception, accusing Stone of lying to Congress about WikiLeaks, tampering with witnesses and obstructing the probe into whether the Trump campaign coordinated with Kremlin to tip the election. Stone says he believes he's being "persecuted" because of his friendship with President Donald Trump. Stone spoke to conspiracy theorist Alex Jones on his InfoWars radio show after his arrest on Friday. He didn't provide any details to support his accusation that he is being persecuted.He says he's "going to continue to fight." Stone said he's innocent and intends to fight to "clear my name against these politically motivated charges." CNN aired video of the raid at Stone's Florida, home, showing FBI agents in body armor using large weapons and night-vision equipment, running up to the home and banging repeatedly on the door. Though not uncommon for the FBI to make early-morning arrests of targets under indictment, it is the first time Mueller has used that tactic. Stone had been predicting his indictment for some time. Stone is the sixth Trump aide or adviser charged in Mueller's investigation and the 34th person overall. The nearly two-year-old probe has exposed multiple contacts between Trump associates and Russia during the campaign and transition period and revealed efforts by several to conceal those communications. The case comes weeks after Trump's former national security adviser, Michael Flynn, was castigated by a judge in open court and just hours before Paul Manafort, his ex-campaign chairman, appeared in court on allegations that he had lied to prosecutors. Sarah Huckabee Sanders, Trump's press secretary, said the charges brought against Stone "don't have anything to do with the president." Trump attorney Jay Sekulow said the indictment "does not allege Russian collusion by Roger Stone or anyone else."